Ein Zufallsfund am Wochenende: National Geographic hat den U.S. Master Sergeant Jeremy Lock interviewt, einen Combat Camera Photographer der Air Force. 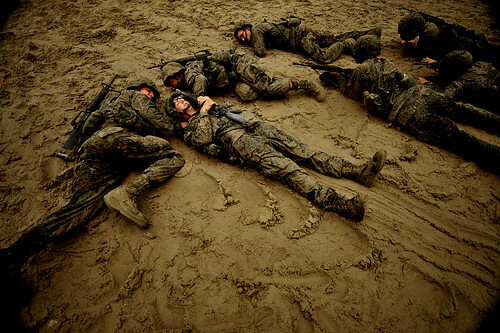 In the military we (photographers) were trained to be assets to the team we were working with. We could provide first aid, act as vehicle commander/driver, fight, or act as a soldier in the stack, going into a house if the need arose. However, I saw myself as a photojournalist first, there to document and tell the stories of our Marines, soldiers, sailors, and airmen. If I felt we (the team) were going to be overrun, or there was danger to one of my teammates and they needed my help, it was time to put the camera down. You just know when it is time. mit etlichen Fotos – mehr finden sich bei einer Flickr-Suche nach seinem Namen.